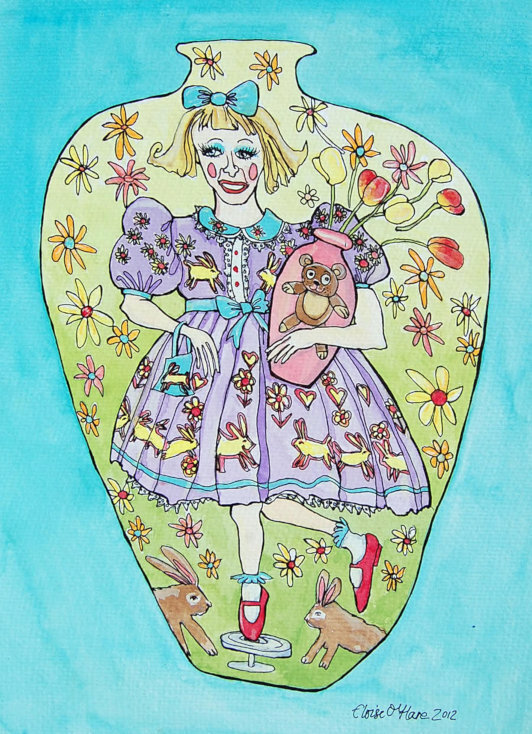 A painting of Claire, the alter-ego of ceramic artist / celebrity Grayson Perry. Grayson gets very muddy while working and likes to change into someone else for celebrity ocassions. Like Grayson's vases Claire's dresses are colourful and illustrative. In the painting she's shown on a vase decorated with flowers and bunny rabbits. The picture has a walnut frame. If you'd like another frame, please leave a note in the checkout and I'll let you know what other frames I got available.